Rural households in developing countries face difficulty in no small part in managing emergent expenditures on various events. It is commonly observed that rural households put up money for each other and swap small amounts of rice or other food stuffs with neighbors to cope with idiosyncratic shocks. This network finance plays an important role in supporting rural households facing an emergency with little or no administrative cost, especially in the society where formal safety-net mechanisms are de facto absent. As network finance is likely to function within a narrow range of blood and geographical proximity, the households tend to form a network in similar economic circumstances. Then, it can be assumed that the effectiveness of network finance will be vulnerable for the poor households whose network members belong to a similar stratum. This paper examines the accessibility of the poor to network finance, using household data collected in the hinterlands of Luang Prabang, Laos. We found that the poor can resort feebly to network finance. Therefore, the role of savings groups to mitigate shocks is more important for the poorer households. Living with various risks, rural low-income households in developing countries face difficulty in no small part in managing emergent expenditures on various events. Among various shocks, temporary diseases represent a typical shock. Though formal insurance schemes are de facto absent in rural areas of developing countries, rural households are known to maintain various informal risk coping measures to mitigate adverse shocks. Households save for various reasons. The better off are likely to save mainly for long-term need, lumpy expenditures including those required in their life cycle, while the worse off save to smooth consumption. This quested for the investigation of micro-insurance as a forgotten third function of microfinance (Zeller and Sharma 2002). Risk-coping measures that incur cash expenditure can be dichotomized into selfinsurance and interpersonal insurance (hereafter, network finance). Self-insurance including withdrawing savings (Jalan and Ravallion 2001) and livestock sales (Kazianga and Udry 2006; McPeak 2004) is a major strategy to mitigate such shocks. However, it is commonly observed that rural households put up money for each other and swap small amounts of rice or other food stuffs with neighbors. Development economics have investigated village insurance, where village households insure each other against idiosyncratic shocks. Informal insurance arrangements based on informal networks such as family members, relatives, and friends serve as vital risk-coping measures (Platteau and Abraham 1987; Rosenzweig 1988; Udry 1994; Fafchamps and Lund 2003; Fafchamps and Gubert 2007). Though a full insurance hypothesis within a community or network is empirically rejected, many studies reveal that partial insurance mechanisms do exist (Townsend 1994; Grimard 1997; Armendariz and Morduch 2005; de Weerdt and Dercon 2006). Recent literature reveals that family and relatives in the village provide loan for production or consumption purposes (La Ferrara 2003), or they make income transfer to those who suffered from shocks (Foster and Rosenzweig 2001; Park 2003). Note that network finance is likely to function within a narrow range of blood and geographical proximity. As the households tend to form a network in similar economic circumstances, the effectiveness of network finance will be vulnerable for the poor households whose network members belong to a similar stratum. The purpose of this paper is to explore the availability of network finance with respect to household wealth in the mountainous areas of Laos where a market economy is at an incipient stage. The household data (N=490) we use are collected by our unique household survey conducted in 2010 and 2011 in Luang Prabang Province of Laos. This paper is organized as follows. In section 2, we examine how transitory shocks are financially coped with. Section 3 examines network finance in terms of rice transfer. Section 4 discusses the range of network finance based on the regression analysis. Finally, section 5 summarizes the main findings and discusses their implications. Among various shocks rural households face, diseases represent a major idiosyncratic shock that incurs financial expenditures not only due to the direct costs for medical treatment but also indirect costs for the missing labor force.1) As discussed in the second paper of this special issue by Fujita, Ohno, and Chansathith, medical treatment is the primary reason for borrowing from savings groups. The proportion of households reporting transitory disease over the preceding two years of the survey is 78.57% (385 HHs), of which 59.48% received medical treatment that incurred expenditure (Table 1). For those who experienced medical treatment, average expenditure was 841.5 thousand kip (approximately US$85) that accounted for 16.79% of annual cash income. Note: a) For those who experienced expenditure. Table 2 shows how the surveyed households in Luang Prabang extend expenditure to cope with transitory disease and other exigencies that took place in the preceding two years of the survey. Emergencies are primarily addressed by self-insurance (own-savings). Self-insurance (own savings and selling property) accounts for 70 to 80% of the expenditures on shocks. Though mostly being poor, the surveyed households do not entirely lack cash in hand. Approximately nearly a half of the households have more than 300 thousand kip (approximately US$30) at home (Table 3). Three hundred thousand kip is almost equivalent to 10 days’ agricultural wages in the areas. As will be discussed later, even in the villages of backward areas, villagers hoard money at home. This reflects poor accessibility to bank institutions and presents the prospects for an expansion of savings groups in the areas. Note: Network finance includes borrowing and gift. Savings group includes borrowing and the withdrawal of savings. Note: No significant difference across months. Beside self-insurance, selling assets (mostly livestock, such as buffalos and pigs), drawing down savings, and network finance serve as important parts of this mix. Livestock in poor villages works an indispensable store of convertible asset to deal with shocks. In-kind transfers are fairly frequent rather than cash in developing countries (Collins et al. 2009). In the villages we surveyed, the incidence of rice transfer is the ordinary affairs of life along with money transfer to cope with idiosyncratic shocks. Fig. 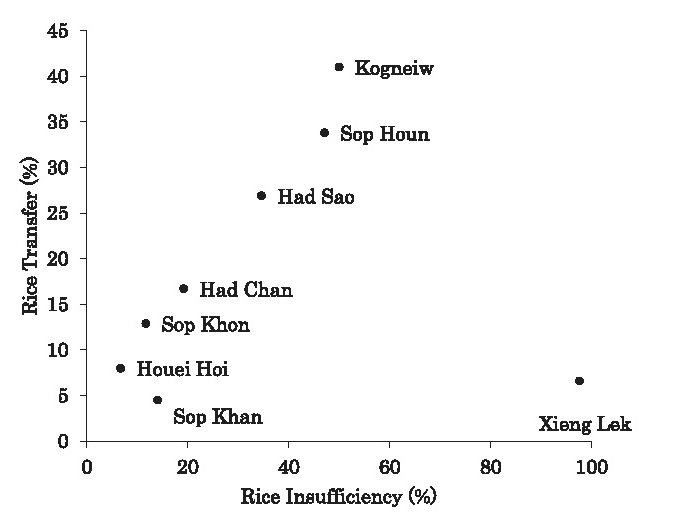 1 presents village-wise association between the fraction of households receiving rice transfer (proportion of households who received rice transfer in the preceding three years of the survey) and that reporting rice insufficiency (the proportion of net rice-purchasing households). Transfer includes both borrowing and gift. Of the sample, 85 households (17.34%) received rice transfer. Among them, 44 received rice-gift and 41 borrowed rice. On average, the former received 58.2 kilogram and the latter 56.6 kilogram of rice. Beside, 57 households borrowed 56.6 kilogram of rice on average from rice-banks run by international NGO. Xieng Lek is an outlier because paddy cultivation is not practiced there. As rice transfer is more common in the villages where the proportion of net rice-purchasing households is high, rice transfer is supposed to work as a device to mitigate rice insufficiency. Cox (1987) considered three motives of transfer: market exchange, gift exchange, and altruism. The last two constitute the motives of network transfer—transfer embed-ded in social relations. Motive is regarded as gift exchange when a donor helps a donee anticipating donee’s reciprocity someday in the future when needed.3) Gift exchange here includes mutual insurance, in which one helps the other only when the latter is in need. On the other hand, motive is regarded as altruism or pure gift-giving when a donor helps a donee just because caring about the well-being of a donee increases the utility of the donor. Efficacy of gift exchange and altruisms depends on whom the social network is formed with. 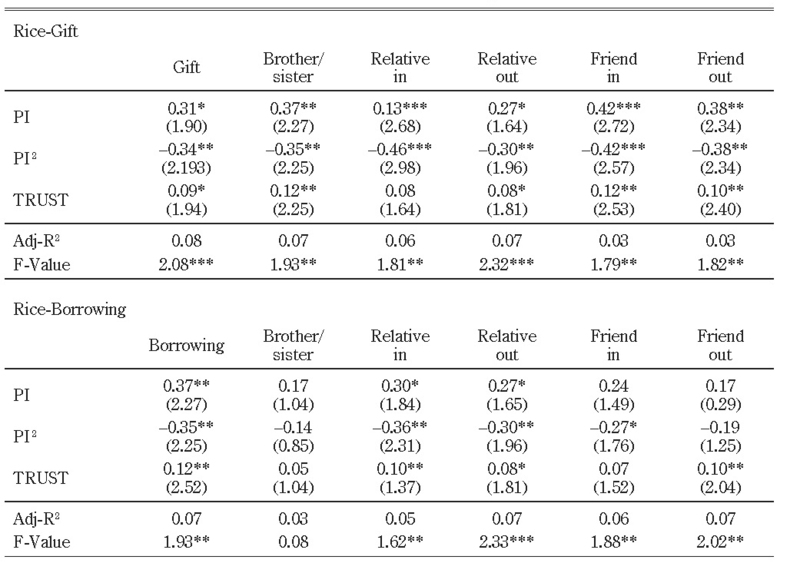 Previous studies suggest that support by family member is featured as pure gift-giving based on altruism, while support by friends as gift exchange. Park (2003) found that income transfer among siblings in Indonesia tends to be provided to those who have lower income, younger age, and female headed households, and hence argued that the income transfer among siblings are motivated by altruism. Foster and Rosenzweig (2001) showed that for the rural households in South Asia income transfer to friends is more likely to be affected by the history of past income transfer (net income transfer to counterparts in past years) than income transfer to family is. As Fafchamps and Lund (2003) show in the rural Philippines, relatives and friends are considered to be the major risk sharing partners for rural households. While risk sharing with non-kin entails the problem of limited commitment (Coate and Ravallion 1993; Ligon et al. 2002), the problem is mitigated by altruism (Foster and Rosenzweig 2001) with respect to risk sharing with kin. Thus, non-kin is supposed to be less reliable than kin as a provider of support in times of negative shocks. Table 4 indicates the proportion of households that received money or time help (Money-Help and Time-Help respectively) from different groups in time of emergency. Also the proportion of households that assisted others when they necessitated the respondents in the preceding three years is presented. Help is available more from kin than from non-kin, and more from those living in the same village than those living outside the village. Both blood and geographical proximity matter. What is interesting is that the receiving and assisting experiences show significantly high correlations (p<0.1%, Spearman). Thus, such help is said highly reciprocal. That the correlation for money help from brothers/sisters is lower than those of others implies that money help from brothers/sisters is relatively characterized as pure gift rather than gift exchange. This will lead us further into a consideration on the efficacy of network finance with respect to blood and geographical proximity. Notes: 1) Question for Money-Help: [Received] Have you received money help when you are in an emergency from the followings in the last three years? [Assisted] Have you offered money help to the followings when they were in an emergency? 2) Question for Time-Help: [Received] Have you called on the followings to spend a lot of time for helping out when there were a serious emergency in your household in the last three years? [Assisted] Have you offered time for helping out the followings when they were in an emergency? 3) “In” and “out” denote in the village and outside the village respectively. Informal network finance plays an important role in supporting low-income households in time of emergency with little or no administrative cost. However, as network finance functions within a narrow rage in terms of blood and geographical proximity, it is likely that the households that form a network belong to a similar economic stratum. Thus, it is hypothesized that the effectiveness of network finance is likely to be vulnerable for the poor households. To examine this hypothesis, we consider perceived plausibility of rice transfer (rice gift and rice borrowing) from others. Economics tend to examine the effect of observed income transfer in an emergency (for example, Fafchamps and Lund 2003; Fafchamps and Gubert 2007). However, idiosyncratic nature of such events is likely to incur selection bias. Thus, we explore the effect of potential (or perceived) support from other households—a belief that one is entitled to support from them—which is widely analyzed in the field of psychology as perceived family and peer support (for example, Stice et al. 2004; Seidman et al. 1999; Procidano and Heller 1983). Perceived rice support (rice-gift) is measured by a question: Suppose there were a serious emergency in your household and you are faced with rice insufficiency. Generally speaking, do the followings (brothers/sisters, relatives in the village, relatives outside the village, friends in the village, and friends outside the village) extend rice to you without an obligation of repayment? (No=1, Yes, but a little=2, Yes, moderately=3, and Yes definitely=4).4) Then, a question about rice-borrowing follows. The results are presented in Fig. 2 and 3. As is shown in Table 5, brothers/sisters are most reliable in obtaining rice gift, and relatives residing in the village follow. Friends residing outside the village are least dependable. We continued to ask a similar question about rice borrowing. Needless to say, rice borrowing is an easier way to obtain rice than rice gift as long as the households can repay (Table 5). Note: Standard deviations are in parenthesis. where X is a set of household characteristics that include age and education attainments of household head, marital status, savings group membership, and net rice surplus. As those control variables are found statistically insignificant, they are not displayed in the results. Wealth is cash income per adult male unit [PI] (unit: 10,000 kip). Cash income includes imputed value of rice consumption (2,000 kip/kilogram) out of rice production. Social capital is gauged by a question asking if the respondent can trust villagers (No=1~Yes=4). VD is a village dummy. Dependent variable of Rice is either Rice-Gift or Rice-Borrowing scores, and Rice-Gift and Borrowing from five classes of people classified by blood and geographical proximity. Rice-Gift and Rice-Borrowing scores are obtained as the principal component score (Rubin Anderson) using the level of the five perceived supports from brothers/sisters to friends living outside the village (Cronbach α=0.95 and 0.95, variance=69.7% and 67.5% respectively). The scores denote respondent’s expectation of gift/borrowing from neighbors and relatives in case of emergency. Thus, the scores represent accessibility to informal support. As is shown in Table 6, the coefficients of PI are negative and significant for rice-gift functions. As average PI is 0.41 and standard deviation is 1.52, most of the data exist on the left side of the inverted U-shape functions. With regard to rice borrowing functions, they are negative and significant except brothers/sisters and friend outside the village. As was shown in Table 5, brothers/sisters and relatives are most reliable sources of rice transfer. Accordingly, the results imply that the poor households are more likely to find it difficult to obtain support from any strata of people, mainly because the network households of the poor are likely to be poor as well. Note: “In” and “out” denote in the village and outside the village respectively. Village dummies are included, but not displayed. ** p<5%, *** p<1%. Stark contrasts exist between the regression results of Rice-Gift and Rice- Borrowing from brothers/sisters and from friends outside the village. While all variables in Table 6 are significant for Rice-Gift, they are insignificant for Rice-Borrowing. Considering the fact that blood and geographical proximity concern the reliability of rice transfer, Rice-Borrowing from brothers/sisters is featured as reciprocal. Network finance plays an important role in supporting rural households facing an emergency with little or no administrative cost, especially in the society where formal safety-net mechanisms are de facto absent. However, the poor have weaker accessibility to network finance. As the range of network finance is subject to blood and geographical proximity, network partners of the poor belong to a similar wealth bracket. Thus, they cannot afford to offer financial help or rice transfer to the fellow people. This paper examined the accessibility of the poor to network finance, using household data collected in the hinterlands of Luang Prabang, Laos. We found that the poor can resort feebly to network finance. Therefore, the role of savings groups to mitigate shocks is more important for the poorer households. As a market economy is not prevalent in the surveyed areas, and thus cash economy has not picked up stream yet. Savings groups established in such economy have only a weak momentum for growth. Even in the initial stage of savings group movement, however, as Zeller and Sharma (2002) refer to micro-insurance as the forgotten third of microfinance, savings groups serve a vital role in coping with idiosyncratic shocks. Altonji, Joseph; Hayashi, Fumio; and Kotlikoff, Laurence. 1997. Parental Altruism and Inter Vivos Transfers: Theory and Evidence. Journal of Political Economy 105(6): 1121–1166. Armendariz, Beatriz; and Morduch, Jonathan. 2005. The Economics of Microfinance. Cambridge: The MIT Press. Coate, Stephen; and Ravallion, Martin. 1993. Reciprocity without Commitment: Characterization and Performance of Informal Insurance Arrangements. Journal of Development Economics 40(1): 1–24. Collins, Daryl; Morduch, Jonathan; Rutherford, Stuart; and Ruthven, Orlanda. 2009. Portfolios of the Poor: How the World’s Poor Live on $2 a Day. Princeton: Princeton University Press. Cox, Donald. 1987. Motives for Private Income Transfers. Journal of Political Economy 95(3): 508–546. Cox, Donald; and Fafchamps, Marcel. 2008. Extended Family and Kinship Networks: Economic Insights and Evolutionary Directions. Handbook of Development Economics Vol. 4, edited by T. Paul Schultz and John A. Strauss, pp. 3711–3784. Elsevier (North-Holland). De Weerdt, Joachim; and Dercon, Stefan. 2006. Risk-sharing Networks and Insurance against Illness. Journal of Development Economics 81(2): 337–356. Fafchamps, Marcel; and Gubert, Flore. 2007. The Formation of Risk-sharing Networks. Journal of Development Economics 83(2): 326–350. Fafchamps, Marcel; and Lund, Susan. 2003. Risk-sharing Networks in Rural Philippines. Journal of Development Economics 71(2): 261–287. Foster, Andrew D.; and Rosenzweig, Mark R. 2001. Imperfect Commitment, Altruism, and the Family: Evidence from Transfer Behavior in Low-income Rural Areas. Review of Economics and Statistics 83(3): 389–407. Grimard, Franque. 1997. Household Consumption Smoothing through Ethnic Ties: Evidence from Côte d’Ivoire. Journal of Development Economics 53(2): 391–422. Jalan, Jyotsna; and Ravallion, Martin. 2001. Behavioral Responses to Risk in Rural China. Journal of Development Economics 66(1): 23–49. Kazianga, Harounan; and Udry, Christopher. 2006. Consumption Smoothing? Livestock, Insurance and Drought in Rural Burkina Faso. Journal of Development Economics 79(2): 413–446. La Ferrara, Eliana. 2003. Kin Groups and Reciprocity: A Model of Credit Transactions in Ghana. American Economic Review 93(5): 1730–1751. Ligon, Ethan; Thomas, Jonathan P.; and Worrall, Tim. 2002. Informal Insurance Arrangements with Limited Commitment: Theory and Evidence from Village Economies. Review of Economic Studies 69(1): 209–244. McPeak, John. 2004. Contrasting Income Shocks with Asset Shocks: Livestock Sales in Northern Kenya. Oxford Economic Papers 56(2): 263–284. Park, Cheolsung. 2003. Interhousehold Transfers between Relatives in Indonesia: Determinants and Motives. Economic Development and Cultural Change 51(4): 929–944. Platteau, Jean-Philippe; and Abraham, Anita. 1987. An Inquiry into Quasi-credit Contracts: The Role of Reciprocal Credit and Interlinked Deals in Small-scale Fishing Communities. Journal of Developing Studies 23(4): 461–490. Procidano, Mary E.; and Heller, Kenneth. 1983. 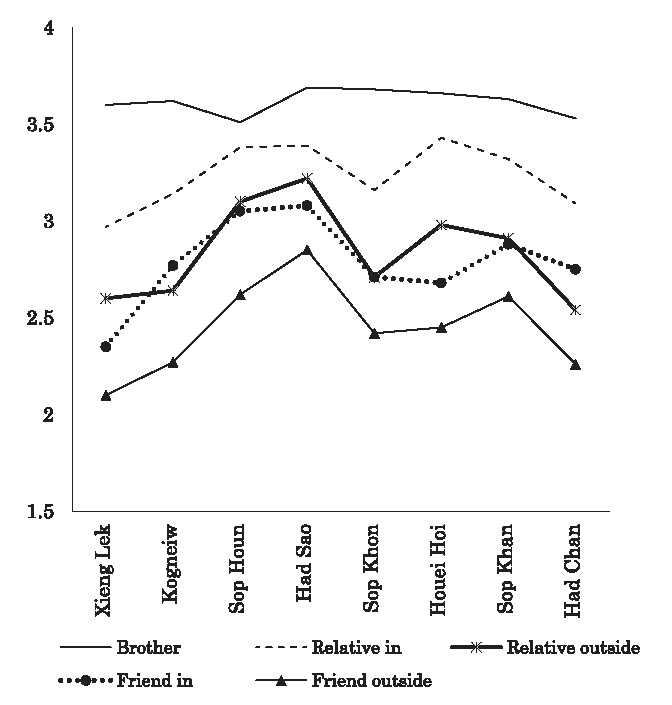 Measures of Perceived Social Support from Friends and from Family: Three Validation Studies. American Journal of Community Psychology 11(1): 1–24. Rosenzweig, Mark R. 1988. Risk, Implicit Contracts and the Family in Rural Areas of Low Income Countries. Economic Journal 98: 1148–1170. Seidman, Edward; Chesir-Teran, Daniel; Friedman, Jennifer L.; Yoshikawa, Hirokazu; Allen, LaRue; Roberts, Ann; and Aber, J. Lawrence. 1999. The Risk and Protective Functions of Perceived Family and Peer Microsystems among Urban Adolescents in Poverty. American Journal of Community Psychology 27(2): 211–237. Stice, Eric; Ragan, Jennifer; and Randall, Patrick. 2004. Prospective Relations between Social Support and Depression: Differential Direction of Effects from Parent and Peer Support? Journal of Abnor-mal Psychology 113(1): 155–159. Townsend, Robert M. 1994. Risk and Insurance in Village India. Econometrica 62(3): 539–591. Udry, Christopher. 1994. Risk and Insurance in a Rural Credit Market: An Empirical Investigation in Northern Nigeria. Review of Economic Studies 61(3): 495–526. Zeller, Manfred; and Sharma, Manohar. 2002. Access to and Demand for Financial Services by the Rural Poor: A Multicountry Synthesis. The Triangle of Microfinance: Financial Sustainability, Outreach, and Impact, edited by Manfred Zeller and Richard L. Meyer, pp. 19–45. Baltimore and London: Johns Hopkins University Press. 1) As to the surveyed households, average work-days lost due to temporary illness for the households whose member suffered from transitory illness were 6.6 days. 2) The proportion of households having members suffering chronic disease is 29.18% (143/490) and average expenditure per affected household is 3,257.79 thousand kip. However, neither informal insurance mechanisms nor depleting assets can cope with these events. 3) Fafchamps and Lund (2003) revealed that in the rural Philippines motive of gift giving is returning favor to other households that provided loan or gave gift to them before. 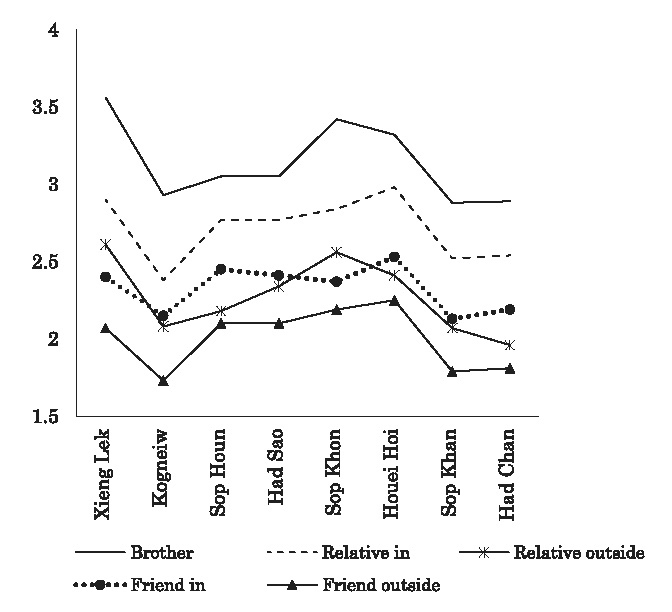 This indicates that reciprocal gift exchange sustains the social network among households. 4) Rice transfer in case of emergency can be measured as giving rather than receiving. However, asking an intention of giving would let respondents put on an impressive show, and overestimates the scores.